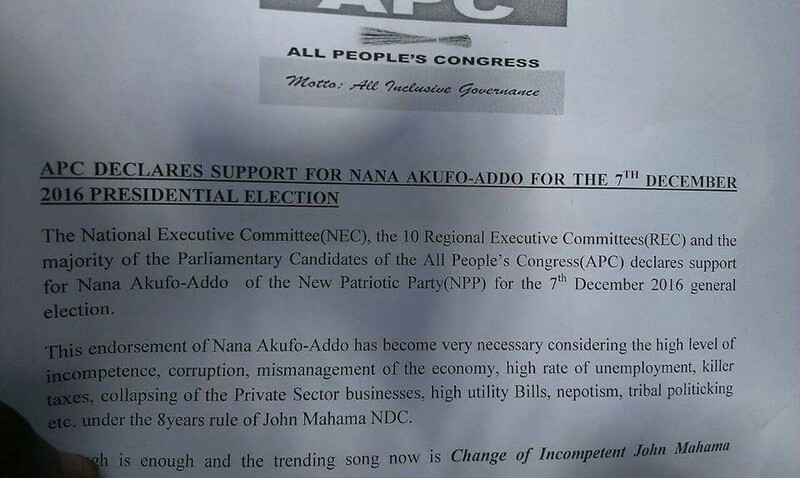 Dr. Hassan Ayariga has changed lanes–as his 2016 formed political party-APC has declared support for the NPP’s flagbearer-Nana Akufo Addo in the upcoming elections. Affectionately called Ayariga Cough, he stated in a press release that he is supporting Nana Akufo Addo to win the upcoming elections–urging all his supporters to vote for Akuffo Addo and the NPP. The endorsement comes a few days to Ghana’s 2016 election–to the shock of NDC’s executives who have been working 8 days in a week, trying to get Ayariga to endorse John Mahama. Ayariga says his endorsement of Akufo Addo has become necessary after considering the John Dramani Mahama’s administration’s unbeatable incompetence and corruption.